Have you heard about the remarkable progress Binaural Beats can bring to your meditation? Perhaps you read how they can help with astral projection and lucid dreaming. Have you been searching around, and wondered if anything good is available for free on YouTube? I commend your frugality. But unfortunately, you’re taking the wrong approach. If you are intent on learning to reach a profound state of trance for free, you can. Indeed people have been doing this for centuries – it’s called meditation. Binaural Beats are simply a short-cut to reach this state – but in order for them to work, they do really need to be a high quality, which tends to cost money. Short-cuts that actually work tend not to be free. I was on Amazon, looking at Binaural Beats, and there was one review I read that made me quite angry. This reviewer had bought a (good) binaural beat recording, and said in his review that it wasn’t worth the money, and he could have got the same free from YouTube. Now, everyone’s entitled to their view, but because of this review, I’m quite certain that people will be reading it, trying a couple of binaural beats from YouTube, and therefore deciding that binaural beats don’t work. 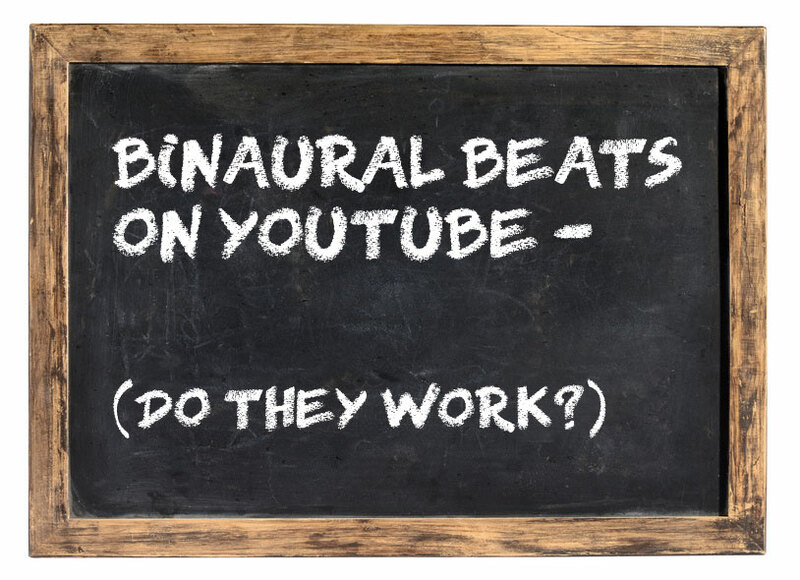 I can categorically tell you that binaural beats DO work, but unfortunately the majority of the ones on YouTube are not very effective – and I’ll explain why that is in a minute. But first, what really bugged me was as a music lover. When I was young, around a billion years ago, music wasn’t free. Somebody bought it, and they may record it on an audio cassette for you, which was naughty but very small scale – but there wasn’t the idea that because music isn’t a “physical thing” it should be free for everyone. How have we got to the point that we resent paying for somebody else’s work/time/effort/creativity? That’s my small rant over with, and now I can get to my main point. See, the thing is these free binaural beats on YouTube are generally simply not very good. Don’t you think you’d want some kind of remuneration for your efforts? Seriously, I mean my little site is free, when it could easily be a membership site – but when you’re talking get-rich and weight-loss…the money that could be made if only a fraction of what they say is true would be mind-boggling. When you check out the file-size of any good binaural beats, you’ll see that there’s literally no way that a YouTube video is going to do justice to this. Have you ever downloaded YouTube videos as mp3s? Then you’ll know what I mean – okay as a ring-tone, I guess, but definitely not an audiophiles dream. To get the full benefit from a binaural beat, it needs to be high-quality, with minimal, hopefully lossless, compression. And by the way, .wav files definitely trump mp3s. Mixed with simple binaural beat that may or increase or decrease in frequency. Even when it does work, it won’t work for long. By the very nature of basic binaural beats, very quickly they stop working. Next thing you know, you’re having to look for a new one that gets you to the same point. Seriously. If You Really Want Free, Why Not Do It Yourself! It’s actually not that complicated to make binaural beats of the type that you’ll find all over YouTube. Audacity software is free, and you can easily find a tutorial to explain how to combine a track of your liking with a beat the frequency of your choice. You can make your own custom, high quality beats. What Makes a Good Brain Entrainment Track? Brain Entrainment tracks nowadays are Light-Years Ahead of of the kind of basic, free binaural beats you’re likely to find on YouTube. The very best beats utilize different types of technologies – while what you find on YouTube is a simple binaural beat, with music or nature sound crudely tacked on over the top. The best ones, like the ones I describe here, actually infuse the entire recording with binaural beats and other brain entrainment technologies. The end result is a track that is simply much more effective. They don’t stop working, and will help you meditate even if you’re hearing impaired. « What's the Best Position for Astral Projection?